A £55,000 pond restoration located in a conservation area near Newmarket. The works included tree felling, removal of fish and water, dredging and reconstruction with blue clay liner, refilling with water and restocking with plants and native fish. Boundary railings were modified to add a rail with circular detail to prevent children falling into the pond. 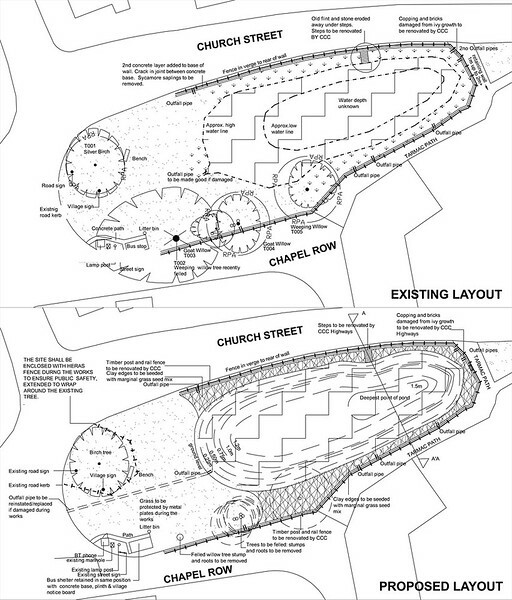 Existing and proposed layout plan of renovations works for a village pond, located in the Ashley Conservation Area, near Newmarket, Cambs.